***SPOILERY SPOILERS OF MAJOR SPOILS! *** Do not read unless you want to get your hopes of seeing a good superhero flick dashed before you even set foot in a theater. Superman v Batman is a terrible film. I’ll admit, there are parts I enjoyed, which we will discuss at the end. But first, underneath its flashy fights, Superman v Batman is a fundamentally flawed film as dull and grim as its color pallet. 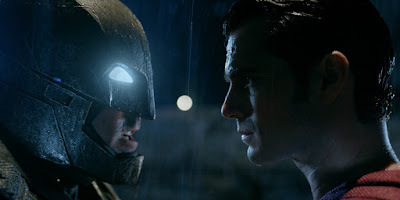 It suffers along two lines: the filmmakers have a crucial misunderstanding of the title characters, and the core of the film - the fight between two iconic superheroes - is a set-piece disaster, billowing with two empty capes. Joss Whedon once stated that if you have two superheroes fighting over a misunderstanding, then the audience isn’t invested in the outcome. Instead, it becomes an antsy affair, as you know the moment the two stop and talk, they’ll (b)romance it out. So, certainly, this fight, the fight of the century, the fight between two of the most popular characters ever: one a broody cynic, the other a symbol of hope, would clash over an ideal, over an issue, over… anything substantial and worth the audience’s time and intelligence. Yet when it comes down to it, the hack filmmakers have them fight over… Superman’s mommy. That’s right. What’s worse is at first, the filmmakers spend an impressive amount of time slogging through a possible motivation and justification for the fight, only for them to throw it all away 5 minutes beforehand to set up radically different reasons. You could have walked into the theater right then and been as confused as everyone else in the audience. And then the two supposed heroes fight (although by then, neither are established heroes), then they stop to talk it out because of course it’s a misunderstanding and not at all a fight motivated by fundamental core beliefs, and then they become best buddies. Joss Whedon called it three years ago. The age of stupid superhero movies should have ended with Avengers. The blue-print to success was right there. 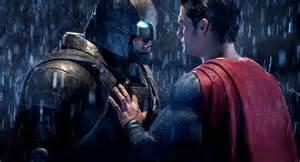 The problem was, Snyder and Goyer were too arrogant to have listened, and the Studio was too anxious to make money. Let’s back up a bit to talk about the characters of Superman and Batman. After all, the fundamental misunderstanding of these characters is the other reason fight falls flat. The filmmakers chose to ignore the classic versions of these superheroes in favor of grim, gritty, Ayn-Randish, post-modernism. But in doing so, the filmmakers didn’t update the heroes for a new generation—they destroyed them. Here’s the problem: Batman doesn’t want to just stop Superman from doing whatever it is Superman isn’t actually doing—Batman wants to KILL him instead. Nevermind that Bruce could see Superman as a flawed hero, just starting out, who may need some guidance from a wizened older Batman. But suddenly, Billionaire Lex Luthor sees Superman as an alien threat and wants… excuse me: billionaire Bruce Wayne sees Superman as an alien threat and wants to KILL him. With Kryptonite. 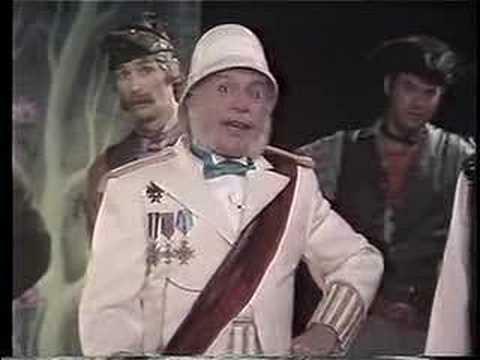 I think you can forgive my confusion, as Batman plays Lex Luthor in this film. Okay… so what that Batman has killed in the comics? So has Superman. After 70 years of history, there’s bound to be a writer who gets it just as wrong as Snyder. It doesn’t make it right. At this point, I've come to the realization that even if Snyder has a remote grasp of the characters, he doesn’t care, because — in order to justify Batman wanting to kill Superman — they show that Batman straight up murders criminals. Snyder has made Batman a cold-blooded vigilante, ala Marvel’s Punisher. 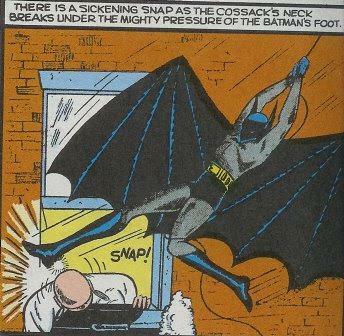 Batman shoots criminals. He runs over their faces with the Batmobile, he sets them on fire, and he tosses cars onto soft squishy human heads. What’s worse, he ‘brands’ criminals so that, inexplicably, they are horribly murdered behind bars. If Superman had been taking the high moral ground all this time, he’d have a firm reason to stop Batman in his tracks. But since Superman is just as guilty of straight up killing his enemies, (unless that warlord in the beginning of the film only ended up in critical condition after being torn through a wall at super-sonic speed) the fight couldn’t have been about that. Surprisingly, despite Superman’s lack of morality, the film spends an hour and a half setting just that type of fight up, only for it to change immediately beforehand. Superman warns Batman to stop (although he’s got no right to do so, no moral ground to stand on). Then warns he’ll stop Batman if he sees him again. Batman sees Superman as a threat to humanity. Then decides the only answer is to stab the Man of Steel to death. In other words, the filmmkers had to drastically alter the character of Batman to bring him to a point where he would want to ‘kill’ Superman. Yet at the same time, they had destroyed the classic, hope and optimism of Superman, which gave Superman no moral business to stop Batman. This means that the filmmakers had to give Superman a different reason, not just to fight Batman, but to kill him. Yes, KILL Batman. Thankfully, Snyder found one five minutes before the fight. Just in the nick of time, too. They gave the two a reason to fight when they could have just as easily talked it out. So, there was no real point. Because fundamentally, the two had no reason to punch each other. Dude, Bruce, have you been working out? And Superman. Poor Superman. Superman doesn’t want to stand for anything in this film, he wants to rescue Lois, brood better than Batman, and generally stand around apathetically as if he just inhaled a mega-dose of Superman III Tar-ptonite. He never, ever, once thought outside the box to engage his opponents. He never, not once, took the moral high ground. His best scene in the movie is when Superman walks calmly into Congress. There’s a touch of Christopher Reeve there. But everything else was rubbish. There were infinitely better ways of handling the wheelchair bomb, the warlord, or asking Batman for ‘help’. And, at the end, Superman could have just as easily given the McGuffin Weapon to Diana to dispatch Doomsday. So, perhaps the best thing he could have done was to die in the end, because in those 30 seconds, he had more character growth than in two entire movies. That gives me hope that when Superman returns, he’ll have evolved into the Superman we know. And maybe that morality will rub off on Batman, and we will start to see a dawn of a new age of justice, rather than the rancid, garbage-heap of ‘modern’ and ‘edgy’ that we got. True heroes last for centuries because of the timelessness of what they stand for, not because they look cool snapping necks and blowing stuff up. There are bits of wonder in the film. I’ll admit, the acting was as good as it could have been with the material the cast was given. Ben Affleck did a great job of playing the murderous Owlman, and I would love to see him play Batman in a film he wrote and directed. Henry Cavill is stuck in a script that doesn’t work for him, but I know he has the spark of Superman within him. We just have to demand, as an audience, that he gets that chance to play him. Wonder Woman was fantastic. Perry White steals every scene he is in. And Jesse Eisenberg played a wonderful villain called, Arcade. What a Marvel comics villain is doing in a DC film, I do not know, but Arcade, as you may or may not know, is a twentysomething son of a ridiculously wealthy father, whom he kills to inherit the fortune. In committing the murder, Arcade comes to find he loves the thrill, so he develops into a crazy, murderous manipulator who creates massive machinations of death for the thrill of it. In other words, Arcade was in this movie, not Lex Luthor. Marvel might want to look into that copyright infringement. Meet Arcade. 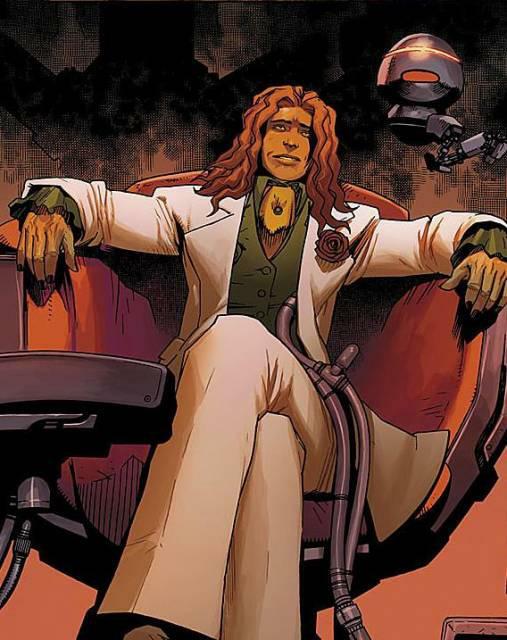 The other, other, Lex Luthor. The ‘Easter eggs” of the other Justice League members seemed contrived and forced. It was as if I were watching previews for future films, in the same way Age of Ultron failed in keeping its film self-contained. Studios should focus on telling the story at hand, not advertising for movies yet to be filmed. On the other hand, I think I’m one of the few people who felt the dream-sequences worked. This is because I am convinced that it is the Flash showing Batman a future earth, and not because Bruce Wayne has suddenly become telepathic. So, I’m willing to give the Flash dreams a pass, although I’m hesitant to see what this universe does to my all-time favorite hero. The shining part of the film for me was a cameo by a certain famous astrophysicist. In his scene, he brings up what I think was the intent to be the central theme of the film, which was the collective gasp earth took after the realization of knowing its place in the universe has changed. It was a real Copernican moment which grounded the film (morseo than any muted color palette) and gave it a true sense of purpose. The world must reassess its place and in that process, come to understand this ‘Superman’ that has changed everything. That was brilliant and a film along those lines could have given the audience something fresh and new, while at the same time, showcasing two of the most well-known superheroes in an inspiring centerpiece of the film. Save their fight for after we see the heroes band together. For now, we want to be uplifted. We want to believe that we can fly. That we can zip line across buildings, with our cape blowing in the wind. But for that, we’ll need our classic heroes back. I'm pleased to know I'm not missing much. The premise is just wrong. It's like lining up all the demons and angels on the playground before letting two average guys take turns picking participants for a pickup game that decides the fate of the universe. Some things are better left alone. As the great Robert Plant would say, "What is and should never be..."